Giselle Vargas, left, is a senior at Wagner, and her mentor, Pamela Osbey, right, is a spoken word poet. 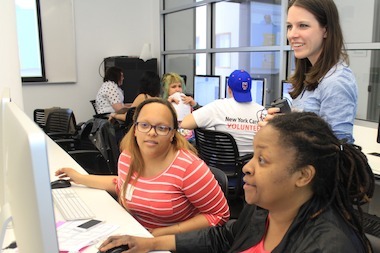 Here, 23-year-old Girls Write Now staffer Sarah Hubschman, center, looks over the digital storytelling projects the pair have been working on. SOHO — Michelle Lesseraux, 15, was nervous about sharing the story she had prepared. "I don't want to bring everyone down," the young writer told a group of women and fellow teenage girls at a recent workshop of Girls Write Now's digital storytelling program with The New School. The group called out their encouragement, and then Lesseraux, a student at Cardozo High School in Queens, told the story of a night when her friend was killed back when she and her family were still living in Bogota, Colombia. "Good job, that was really good," Giselle Vargas, another teen participant in the program, told Lesseraux when she had finished. The dozen young writers and their mentors have spent the past school year meeting weekly and attending "dorkshops" aiming to teach the digital tools that will prepare them for college writing programs and creative jobs. 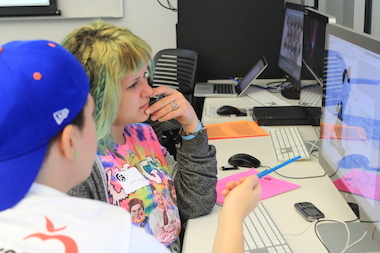 Michelle Lesseraux, 15, and her mentor Tana Tymesen, 28, work on Michelle's digital storytelling project. This Saturday afternoon, they will tell their stories and showcase multimedia installations they have created in a show at Art in General on Walker Street. The mentors and mentees were paired at the beginning of the program based on their applications and a quick, speed-dating-esque meet-and-greet. Sally Ferris, 15, a sophomore at the Professional Performing Arts School, was paired with Jennifer Doerr, 35, a fiction MFA student at the New School. Doerr and Ferris have similar backgrounds in theater and the performing arts, and they also discovered a shared sense of humor. Ferris likes writing poetry, but before participating in the program, she often felt inadequate. "I thought [poetry] was this big romantic thing and I wasn't smart enough for it," Ferris said. "I was kind of scared to even attempt it." A slam poetry workshop gave her confidence and helped her look at the art form in a different way, and now it's her favorite medium. "You can write poetry about anything," she explained. "As long as you want to write poetry, you can write poetry." Doerr was elated at Ferris' newfound confidence. "There's this idea that literature is for an elite few and it's not true," Doerr said. "Art is for everyone — no one should be intimidated." Multimedia installations will be on display at Art in General at 79 Walker St. from 2 p.m. to 5 p.m. on Saturday, May 3. Storytelling performances begin at 3 p.m. To RSVP, email rsvp@girlswritenow.org.